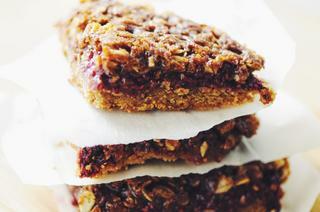 These Gluten-Free Double Berry Chia Seed Jam Crumble Bars make for one healthy and delicious breakfast, snack or dessert! Chia seed jam in and of itself is amazing. But, pair it with walnuts & put it in-between a buttery shortbread crust & crisp toffee-like oat crumble topping, and oh my, divine it is! If you've never made chia seed jam before, then you are in for a real treat. It is incredibly quick & easy to make, and healthy to boot! This recipe will work with any combination of fruit your imagination will conjure--please do have fun with it! I created these bars with strawberries & raspberries as my main inspiration, wanting to make them into a not too sweet treat that was also filling & fun to eat. These were a real winner with my family, with their incredible combo of textures, and oh so amazing flavors! Double Berry Chia Seed Jam (Gluten Free, Vegan): In a saucepan over medium heat, combine berries & maple syrup. Cook for 10 minutes, or until berries are somewhat broken down. Turn heat to high & boil a few minutes while stirring continuously to break berries down completely. Turn off & remove from heat & then stir in chia seeds & vanilla. Let sit at least 10 minutes. Jam will continue to thicken as it cools. Use or store in an airtight glass container for up to 2 weeks.Double Berry Chia Jam Crumble Bars (Gluten Free):Preheat oven to 300°F. Line an 8" square or round pan with parchment paper, set aside.In a large mixing bowl, combine all shortbread crust ingredients & mix until evenly combined & smooth.Press crust dough into parchment lined pan using your fingers until compact and evenly spread. Bake for 15 minutes.While crust is pre-baking, prepare chia seed jam if you haven't already. Otherwise, prepare your oat crumble topping.To prepare your oat crumble topping, mix together oats, sugar, flour & spices until evenly combined. Chop your cold butter, add in to your mixed ingredients, and then combine with your fingers until a crumble forms. If butter melts while mixing & something resembling a dough forms, don't fret--it will still work out just fine!When your pre-baked crust has baked for 15 minutes, remove from oven & then turn heat up to 350°F.Let crust cool for a few minutes (if you haven't already).For the filling, spread your chia jam evenly over pre-baked crust & then sprinkle with your chopped walnuts.Top your filling with your oat crumble topping, using your fingers to make sure all is evenly covered. Press down with fingers slightly.Bake for 35 minutes in your 350°F oven, or until jam is bubbling out sides & your crumble topping is firm & crisp.Let cool before slicing.Enjoy!